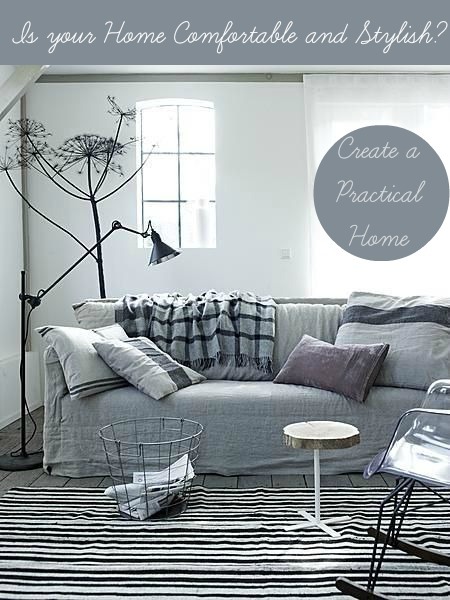 I talk a lot on this blog about making your home look stylish in an inspirational but achievable way. I want the ideas, suggestions and products that I write about to be lovely to look at and add something gorgeous to your home. I can be partial to choosing items that are more stylish and gorgeous maybe than they are practical. And when many of us live in family homes with young children around I know that some ideas just won’t work. I do want people to be adventurous though and try new and exciting interior ideas but I appreciate that they need to be balanced and realistic. So with that in mind today I wanted to write about how we can make our homes comfortable first, and stylish second. Well I’ll try anyway! Ok so what do we need to ensure we do in the Living room so that we don’t sacrifice comfort and practicality. Well one of the top things to think about is flooring and seating. On the floor make sure you have something that works for your house and family. Seriously, that gorgeous cream carpet will be wasted after half an hour with your toddler, and original wooden floorboards are no good in a drafty old house (I have first hand knowledge of this one). With seating make sure you get to sit on the sofa before you buy it. Cheaper online versions are great, but you really will want to test the comfort factor before you buy. And of course, if you do have smaller children ensure you go for wipe clean leather or washable covers. Comfort and practicality are huge features required in the bedroom. Those wardrobes may look amazing but will they hold your full shoe collection or his array of suits. Does your bed fit the bill? A cheap mattress won’t be worth it in the long run, much better to go for something like a pocket sprung mattress with memory foam to ensure a good night’s sleep. You might think it’s good value to buy standalone units but if they don’t provide the storage you need it may have been wiser to purchase the fitted bedroom in the first place. Luxurious, soft bath sheets are a real treat after a long hot bath, but if you haven’t got anywhere to hang them to dry it could be a soggy disaster. Ensuring you have enough space to store your towels, your bathroom products and kids’ bathtoys will create a more comfortable bathing experience. So I think it’s clear that if we give plenty of thought to designing our interiors and not simply buying products because we love the look of them (I must repeat this mantra!) we can have a comfortable, practical and stylish home. Previous Post Is Double Wood Interior Design In or Out of Fashion?